Are you getting engaged or getting married soon? Looking for the top class themes to make your website desiring to the guests. If you are looking for then you will find some very good quality and Gorgeous unique wedding theme. This post will help to find out the most popular WordPress wedding theme. These themes are the most beautiful and stylish themes at the present time. People are now getting modern and search for a good theme to celebrate their happiness ceremonies in a modern and stylish way. For those themes are getting increased and some are doing very impressive. Here is those impressive hand pick theme collection by our qualified team member. You can take a short look at these themes you may have found a good one. 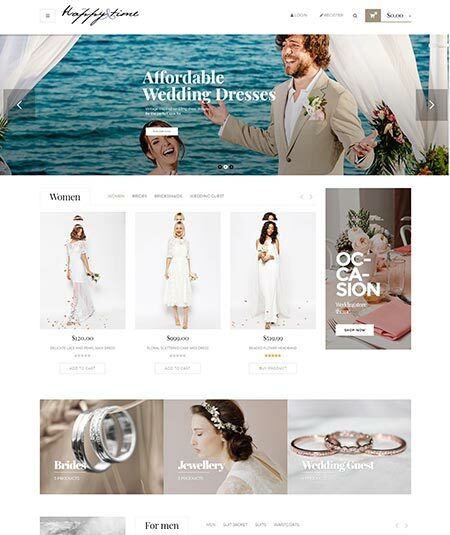 How to choose the best WordPress Wedding theme? Well, first you need to think about the budget you have. If you are confused with a couple of themes then you can check the themes and other ratings. Some themes give you the testing 1-month money back guarantee offer. You can have tested them. Some themes have done a very very impressive format but they are a bit costly, you can increase a bit budget and get them. 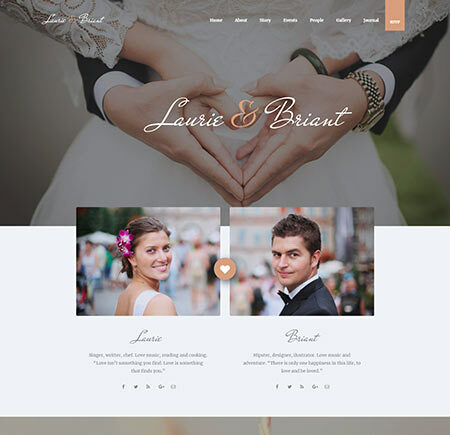 You can just follow our impressive list to choose the besWordPressss wedding template. Every template comes with fully responsive and multipage design. Most of them have the complete demo with one-click demo features. Also as an admin manager or owner if you don’t know to code properly or if you don’t have any idea about WordPress structure and framework then no worry about this. Here most of the listed template has the premium page builder features that let you to do the best unique design into your website. However, these themes give many advantages and a reliable supporting team is always ready for helping the users. Many important features and plugins are found here. So Take a look the below wordpress wedding themes and choose like your wishes. 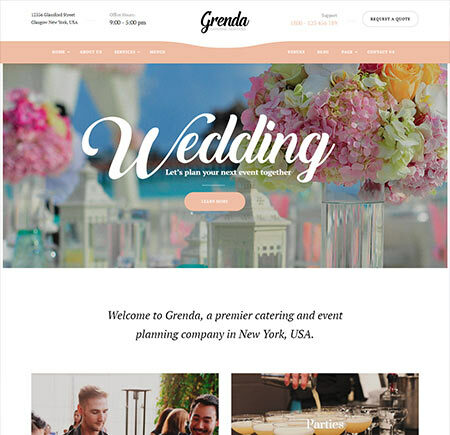 Grenda is an amazing and responsible Catering Service wordpress wedding theme. The powerful features of this theme are really attractive and helpful. One can build their page, edit, update and add contents by the support of the theme without knowing coding. Grenda is suitable for websites about restaurants, bar owners, banquet halls, catering companies, bakeries and others. This theme supports one to take complete control over their website that’s how owners can market themselves smoothly. It has some great features to get easy with websites. SEO optimized, One-click Demo import, Engaging blog, Unlimited color skins are the most attractive features. Also this theme has some more important and interesting features. Grenda has also some helpful and impressive plugins and 2+ Homepage Demos. Opal Service, Slider Revolution, Contact Form 7, Mailchimp, Event Calendar etc. are the main and powerful plugins. Users can easily customize everything. Alis comes with a great support for them who are looking for a theme for a Wedding and wedding planner business. Its a very lovely and a perfect theme for crating and decorating a website about wedding planner business. Alis gives many advantages to the users. They have a 24/7 dedicated support team who are always ready for giving every information and helps. The most advantageous fact is they gives a 30 days money back guarantee. User can create personal icons as their wishes. The key features are really amazing here in this theme. Live editing, 100+ help articles, translation ready, exceptional page-load performance is available in this theme. Also there are some compatible plugins such as Silder Revolution, Cube Portfolio, premium icons etc which were paid plugins once now for free. Also Instagram feed, WPML Jetpack etc are free here. 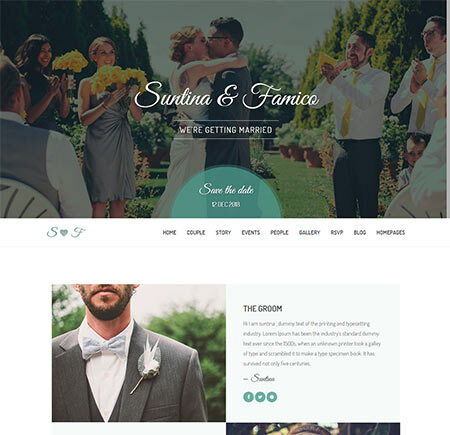 Sweetinz is a colorful, clean and modest WordPress theme, specially designed for use as a wedding WordPress theme. They present Sweeting with lots of amazing features and functions. Tons of options will also make you free to customize your theme by yourself. It includes 5 color options with the colorpick system. Also, there are different options for font and icons. So you can decorate your theme as your wish. Sweetinz is also with a fully responsive and clean design. Different amazing features such as Countdown, Couple Timeline, Location Map, RSVP, Groomsmen, Bridesmaid, Gift Registry and others are available here also. It is user-friendly and very easy to use. Sweetinz is building with powerful page builder and bookstrap 3. 24/7 customer service is also active for Sweetinz. Nothing else, I think, is missing in this amazing WordPress theme. Now, it’s your choice whether to grab this stunning WordPress theme. Yes, it can be an organizer to make a perfect wedding day for a perfect couple. If your intention matches with this purpose you can meet Perfect Couple. 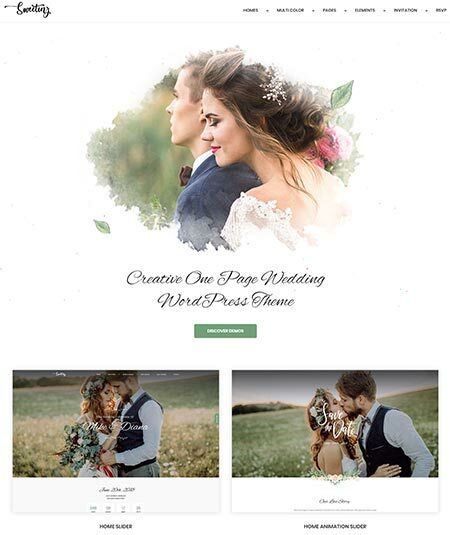 It is, in fact, a clean and beautiful WordPress theme for wedding purpose. Let’s meet what it will offer. Perfect Couple is with the modern and smooth design. It is very easy to use and install. You will also get the update with no added fees. Again it is fully responsive and so you can use it with any of your devices. A wedding theme must have attractive and mesmerizing color and design. So, to decorate your theme with multiple color, fonts, and icons, you can have tons of options. The typography options are also amazing here. Perfect Couple will allow you to make a portfolio column and bios option. It has also the registration option and photo gallery. The 500 hundreds user of it also gives a positive feedback. So you can experience it without any doubt. 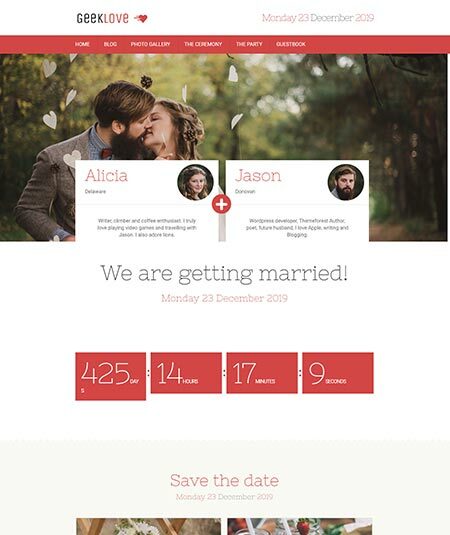 Are you interested in having your own WordPress theme concerned with wedding purpose? If so, Eternity can be a great option for you. In fact, Eternity is an elegant, minimal WordPress theme with a beautiful but powerful design. They present Eternity that is built on ZURB Foundation Framework. It has entirely responsiveness. So to use it on your smartphone won’t be a problem. Again it is much user-friendly and easy to use type WordPress theme. Are you likely to have a WordPress theme that can be decorated now and then? If yes, you can rely on Eternity. We all know that, for a wedding WordPress theme, page design and layouts are very important. Eternity always gives you enough options. Eternity also includes lots of breathtaking features like RSVP, CSS3 and HTML support. It supports other languages too as it is WPML supported. For further inquiries, you can browse it on the internet. So, best of luck. 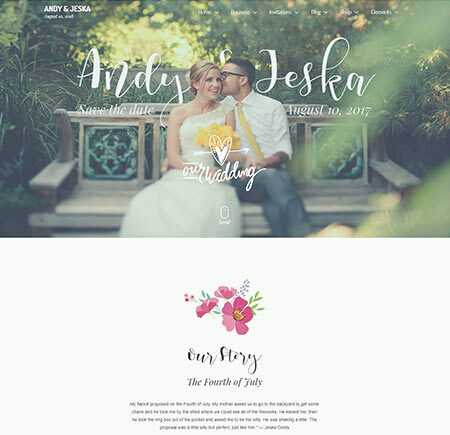 Let’s meet a whimsical WordPress wedding theme, Jack and Rose. 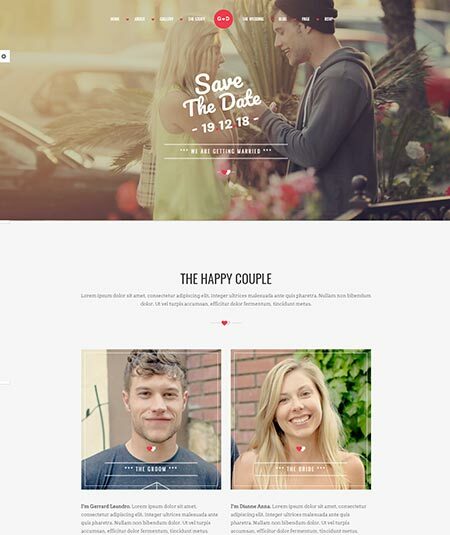 It is minimal, clean and tidy WordPress theme for both the couple and the planner of a feast. So, don’t make it late to experience its amazing features. Then have presented Jack and Rose with the powerful drag and drop page builder. Besides, it has one click demo, easy installation, and maintenance. Again it is also with HTML and CSS3 code. If you are not a native English, no problem. It has WPML that refers to the multiple languages support. It is fully responsive and retina ready. So you can use it even with your smartphone. Jack and Rose are also cross browsers compatible with almost all the necessary social media icons. If you think, you need some more features, you can check it on the internet. I am pretty sure that it will never disappoint you. 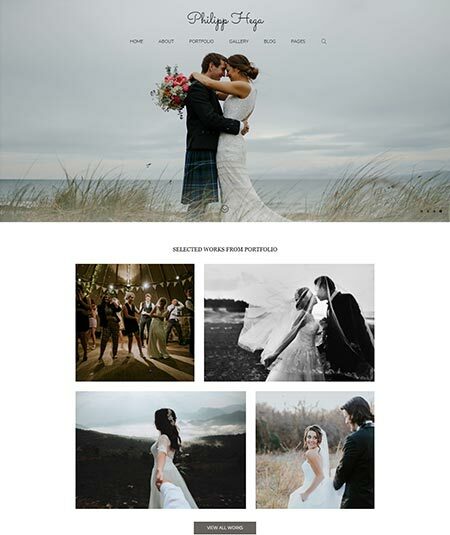 Meet another impressive wedding purpose WordPress theme Weddlist. 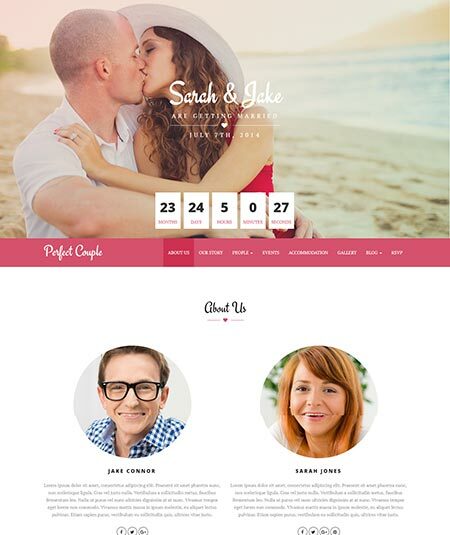 It is an amazing, easy to use WordPress theme that is referred both the couples and planners of a wedding ceremony. So the thing you should do first is to check out its features. Weddlist comes with tons of impressive and important features as well as powerful structure. It is built with HTML and CSS3 support. It is also built with the king composer page builders. The necessary options you will get must cool your heart. Like couple to-do list, budget calculator, wishlist, a couple add a review on each vendor item, real wedding concept etc. So what else you want to have? It is WPML support and so it won’t be a problem if you are not a native English speaker. Rather, it has one click demo, easy installation, and maintenance as well as 24/7 customers service. So what do think about it? Another eye-catching wedding WordPress theme is Aimer. It’s aim is to help you to make your wedding day just like your dream. The team thinks, Aimer is for the lovers and not just for their wedding but also for engagement, anniversary etc. Aimer is a beautiful, unique and modest WordPress theme with powerful structure and functions. It is built on the bookstrap framework. It is entirely responsive that means you can operate even with your smartphone. Besides, Aimer is translation and retina ready. It has smooth scrollbar and CSS animation system. To say on above, it is really a very unique and gorgeous WordPress theme. If you think so, you can try it. 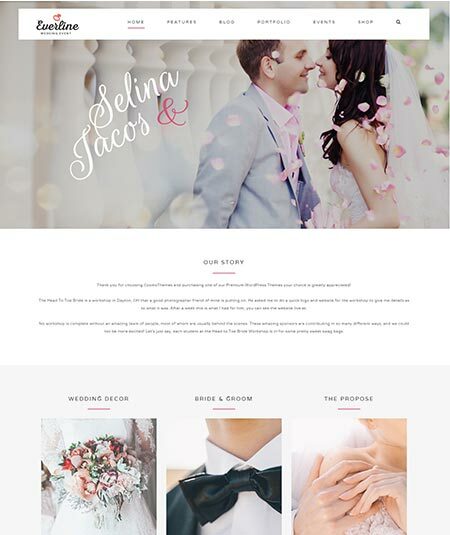 Lilac is an elegant and modern WordPress theme that is specially designed for couples who want to have a website for their wedding. Lilac is beautiful and at the same time very powerful and functional WordPress theme. If you start using Lilac, you will be surprised by its awesome features and options. For example, event Time-line, wedding Countdown, google maps integration and custom markers, Gift section, Gallery section etc. Besides, you will have the bridesmaids and groomsmen section. Along with these interesting facts, lots of other important facts will appear here to make a very pleasant memory for you. Lilac is built with the powerful drag and drop page builders including the visual composer system. Again it is the parallax video background. All its features are enough to make your wedding day as you expect. 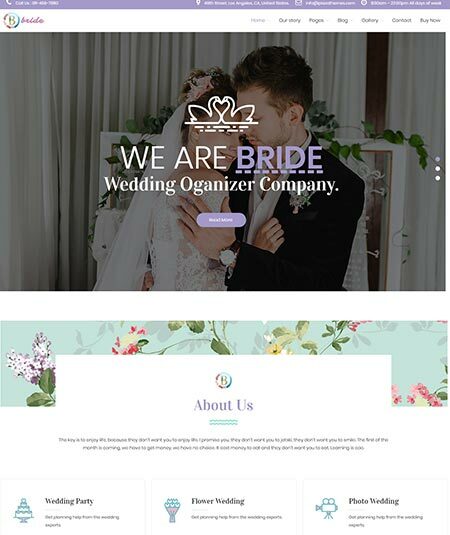 Bride is an awesome, clean and flat, modern WordPress theme. It is specially organized for the wedding purpose. It has tons of amazing features and functions. Its mesmerizing view will also catch anyone’s eyes. The team presented Bride with all the necessary layouts and homepages. It includes lots of color options and fonts with icons. So, you can decorate this theme when you want to. Bride comes with WTML support that will let you use the theme with your own language. Besides, it has HTML and CSS3 support. Again it will help you any time as it has 24/7 customer support. If you have some other options in your demand list, you can browse it on the internet. I am pretty sure, it will not disappoint you. Because, almost all the features, a good wedding purpose WordPress theme should have, are available in it. 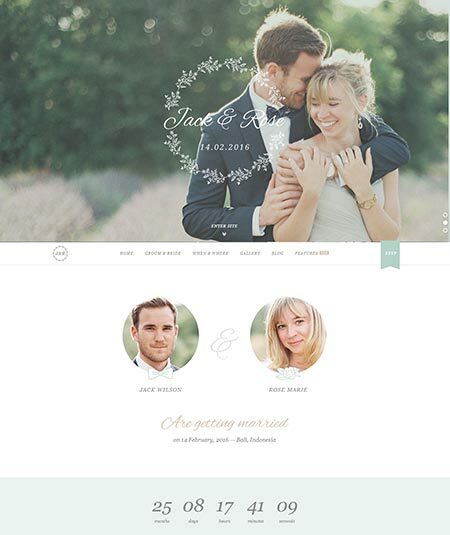 If you want to be a memory maker on that beautiful day of wedding, you should have a responsive WordPress theme. 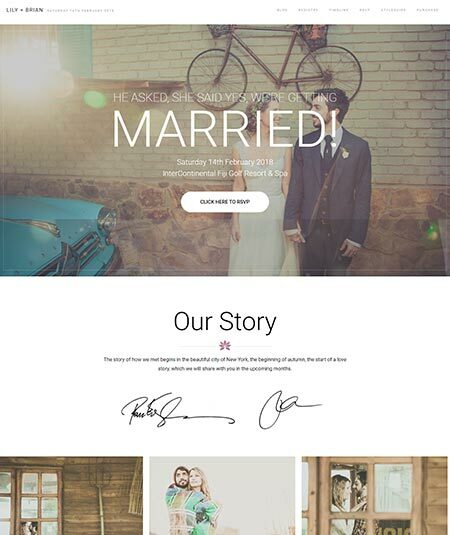 So, you can try a gorgeous wedding WordPress theme, Wedding & Marriage. Let’s check what it will offer. For this great WordPress theme, you will always get tons of facilities and features to attract your clients. It comes with a fully responsive design and is very user-friendly. So don’t worry if you don’t have an expensive design. This amazing WordPress theme includes one-click demo along with the Bookstrap 3. It has numerous layouts of different sections. Again, it is WooCommerce plugins compatible. So it would be a great source of business for you. If you want to have a theme of your own design, its okay. You are allowed to decorate it by yourself. For this, you can get tons of color options and google fonts. So, I think all the necessary features are already here. So it would be a great companion for you on the way to make your sweet memory. 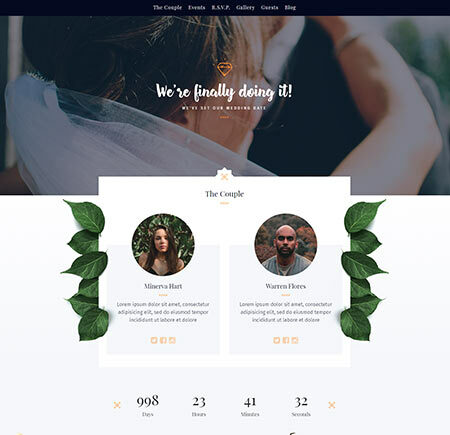 Let’s meet PH, a beautiful and functional WordPress theme that is specially designed using for a wedding WordPress theme. It has a clean and modest design with tons of exclusive features. So let’s see what it will provide. PH is presented with being fully responsive and user-friendly. So you use any of your smart devices to operate this theme. Again, it has lots of awesome layouts of both photo gallery and portfolio. To decorate your theme as you wish to, you can enjoy hundreds of options for color and fonts. Always remember that couples choose themes with the minimal, cool and cozy design. Besides you don’t need to be worried if you are not a native English as it has the WPML support. It is also retina ready and super first. It includes one-click demo too. So what’s more you want to have? If there is something more, please browse it on the Internet. I hope it won’t be a cause of your dissatisfaction. 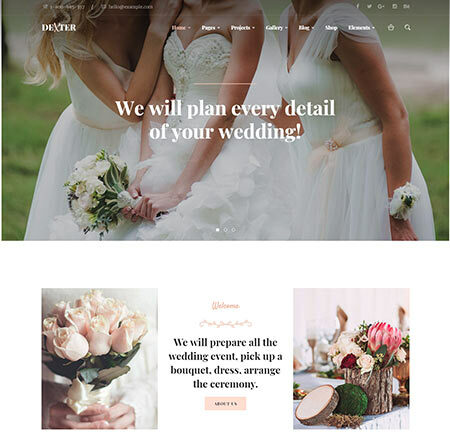 Lily is a beautiful, handcrafted, clean and easy to use WordPress theme for the use of wedding purpose. To make a very pleasant wedding festival, you can use this website because all you need is included. So, let us check out its features and facilities. Lily provides you almost all the options and facilities you will need for a perfect wedding. For example, it has countdown options, Photoshop files, photo gallery, guest lists, budget lists and so on. Being with exclusive features, Lily also possesses a good quality structure. It is valid for the HTML and CSS3 codes. It is also translatable and with WPML support. Again it is fully responsive and retina ready. Lily will help you operate it by any of the browsers because it is cross browsers compatible. Besides, it has demo content and one-click installation. So all is for you to make the day just like a sweet dream. Best of luck. 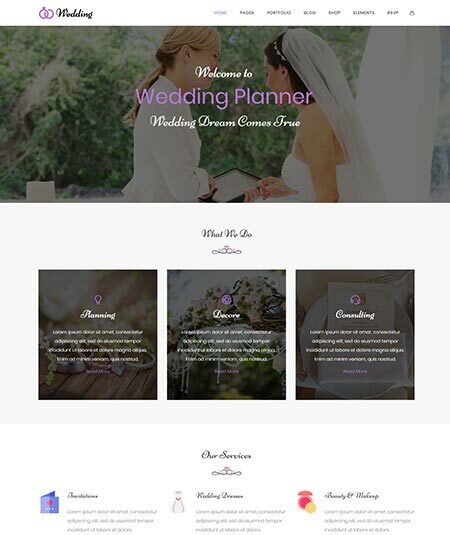 It’s another amazing WordPress theme for wedding purpose just like the name suggests. But not just the wedding couple and planners but also the photographers, event planners, freelancers, and photo lovers can use it. Then, let us see what we can get from it. 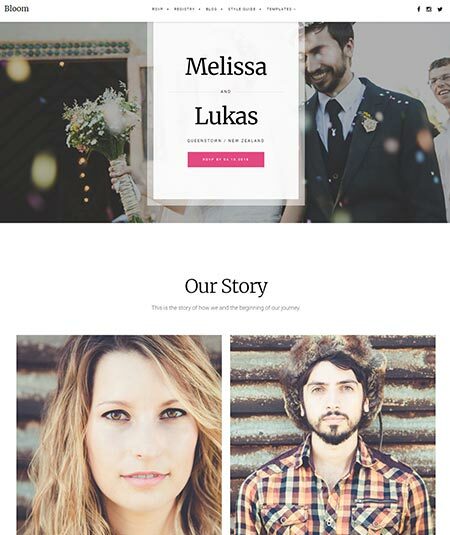 Wedding is a clean and responsive WordPress theme. So you can use it even through your smartphone. It is also with retina support and user-friendly. It has a smooth scrollbar, auto translation option, social media icons and many more. This beautiful WordPress theme will amaze you with it’s mesmerizing functions. Like, photo gallery, homepages and layouts, color options and tons of Google fonts etc. It is also cross browsers compatible with a powerful setup. Wedding will offer you free update and 24/7 service. All the necessary facts are included too. If you have some more functions in your demand list, please check it on the internet further. You may get them too. I am sure that, this time you will be very happy to meet Happytime. 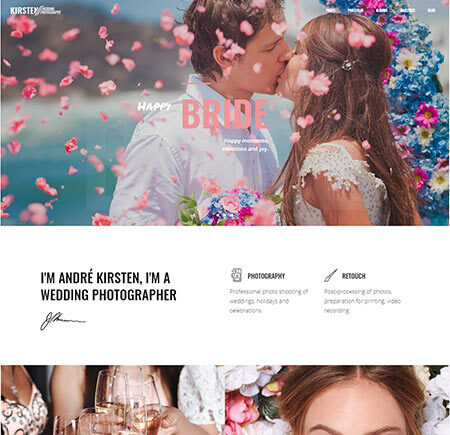 It is a WooCommerce compatible WordPress theme for fashion and Wedding. It is such a useful theme that it will be a difficult task for you to find its fault. Happytime comes with being WooCommerce compatible. So it can help you to make your website an online wedding store. Besides, it is ease of customization and installation. At the same time, it is fully responsive and retina ready. Another great option SEO optimization is also available for Happytime. This fact will help you to maximize your site performance. It also includes one-click demo and 4 premade pages. The smooth scroll and beautiful design will also good for more clients. So what’s more you want to have? I think there is nothing left. It is like an all in one type WordPress theme. So don’t make it too late to grab this amusing WordPress theme. Are you getting married and want to make a sweet memory on that day? To make your dream true, a wedding website can be a very good companion. So let us meet Geeklove, an elegant, minimalist and responsive WordPress theme for a wedding event. Geeklove will offer you thousands of amazing ideas and systemic facts. Like wedding event planning, RSVP, guestbooks, countdown, budget list, photo gallery, notes etc. This feature will help you to do everything systematically and perfectly. 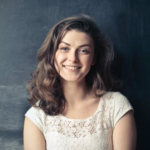 The features, Geeklove possess will also make you happy. It is built with HTML and CSS3 codes and Inbuilt SEO Settings. Again it also includes WPML that means the multiple languages support. Besides, it is fully responsive and retina ready. Geeklove also let you decorate it as you want to. It has amazing typography options and admin panel. If you think all is here, don’t hesitate. I think Geeklove can be a great help in the most important day of your life. 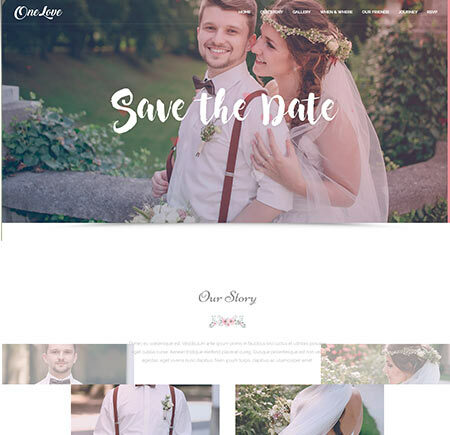 Another beautiful wedding WordPress theme, Everline comes with a modest and clean look with responsive design. It is very good to use for a wedding event, an engagement programme or any other festivals events. Let us check the features of Everline out. If you are supposed to use Everline for a wedding event, you will get each and every function here. Like guestbooks, photo gallery, budget list etc. It’s amusing looks will blow like a warm wind on your eyes. Everline is built with the visual composer page builders with the drag and drop functions. It is also with WooCommerce compatibility. Besides, it is fully responsive and user-friendly. So just go for it even only with your Smartphone. You are not an English speaker? No problem. It won’t harass you because it is RTL supported. This beautiful theme is very easy to use and install even update. So, it won’t be rational to not to recommend it for you. The name suggests the purpose of this amazing WordPress theme. Wedding Day is really an elegant and fashionable event and programme management WordPress theme. It’s a beautiful look and stunning performance amaze anyone. Let us meet them. Wedding day is created with both the Visual Composer and WPBakery page builders. It has SEO optimization and 100% responsiveness. It is multiple languages supported with free update and support. This stunning WordPress includes interactive Ajax support and 24/7 customer support. Again it also has different features like photo gallery, guestbooks, budget list etc. It is cross browsers compatible and user-friendly too. Not just for a wedding purpose, you can also use it for any kind of events. I have enough confidence that it won’t be a cause of your dissatisfaction. So think about it. Meet Bloom, an impressive modern WordPress theme for event and programme management. Bloom includes powerful design and beautiful outlooks. To make your event memorable, it will provide almost all necessary support that is possible. Bloom is presented with lots of amazing facts that will be helpful to make the event as you want to. It has options like guests RSVPs, photo galleries for your blog, location Maps of the events, timeline schedule and so on. For its quality, I can assure you because it possesses almost all the features, it should have. It had free support and guidance, demo content, valid HTML and CSS3 codes and WPML support. Again, it is 100% responsive and user- friendly. For more information, you can browse it on the internet. I hope you won’t be disappointed. Furthermore, it is enough functional that if you are not a native English speaker, you can handle it with its translatable features. So I think, you can rely on it. 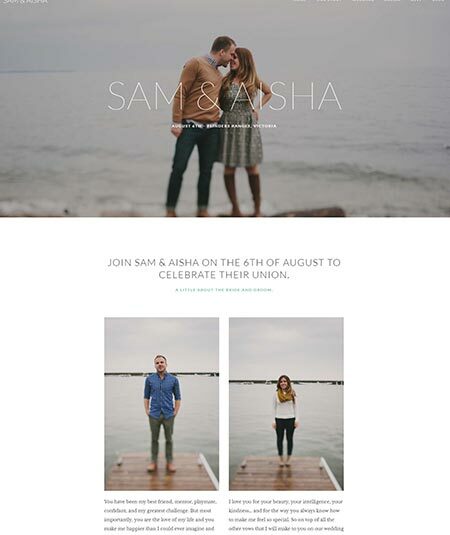 Meet another tasteful wedding and events management WordPress theme, Union. It is presented with a handful and particularly essential features. These will be very helpful for you to handle everything systemically on your big day. Union is packed with multiple design and options for decoration. You can even design it by your own with the numerous color option and Google fonts. It is also 100% responsive and mobile friendly. Besides, it has one click demo data and fast installation. The smooth scrollbar and user-friendly system will also help you to operate it easily. It is also cross browsers compatible including all the necessary social media icons. To make your big day just like your dream, you can ask Union to be your companion. I am sure that it won’t disappoint you. All its features will help you to keep your eyes on each single facts. Now it’s up to you completely. 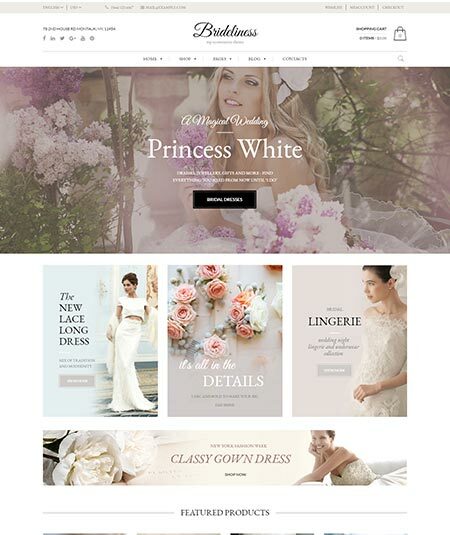 Do you want to have your own wedding or bridal store WordPress theme? If so, you can meet Brideliness. It can be an excellent opportunity for you. Brideliness is, in fact, a clean and responsive WordPress theme. Then, let us know about it briefly. Brideliness comes with all the WooCommerce plugin. So it can be a source of your extra income. Because through these plugins you can establish your eCommerce bridal or wedding store. Besides, it is fully responsive and user-friendly. SEO optimization is another great feature of a good WordPress theme. It will help you to have more visitors. Furthermore, it is cross browsers capabilities with all the popular social media icons. As it is WPML supported, there will be no problem if you are not a native English speaker. Besides these all breathtaking features, many more are waiting for you. You can enjoy tons of color options and fonts to design your theme by yourself. If you think, all you need is available here, you can grab it. 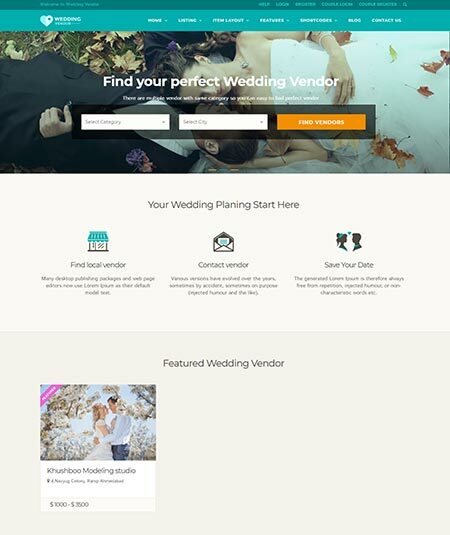 Another fabulous Wedding event management vendor directory WordPress theme is Wedding Vendor. 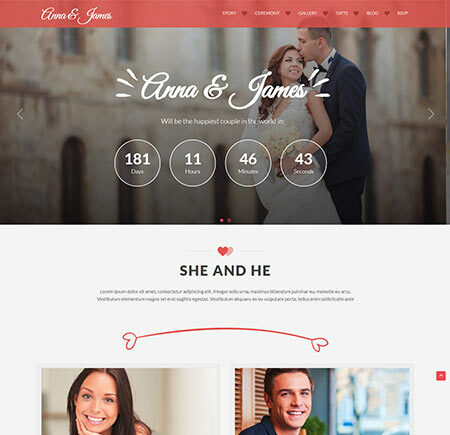 It is actually a clear, sharp and elegant WordPress theme for wedding suppliers and couples. So, let us see what it will offer. Wedding Vendor can be a personal assistant for you to ensure all support for your big day. It can help you in choosing a venue, photographer, florist, dresses etc. Besides, it can also help you in selecting hotels, DJ/music, wedding cake, beauty, gifts etc. The team packed Wedding Vendor with lots of breathtaking features. It is fully responsive with valid HTML and CSS3 code. It is also contacted from7 and Mail chimp ready. So it won’t be a problem to operate this theme whether or not you are a beginner. Wedding Vendor is cross browsers compatible. So you can use it with any of the popular browsers through your smartphone. If you have some more options in your wish list, you can browse on it. I think you will get all you need. Are you planning to make your wedding day great, a wedding WordPress theme can be a solution for you. So you can try WP Forever. 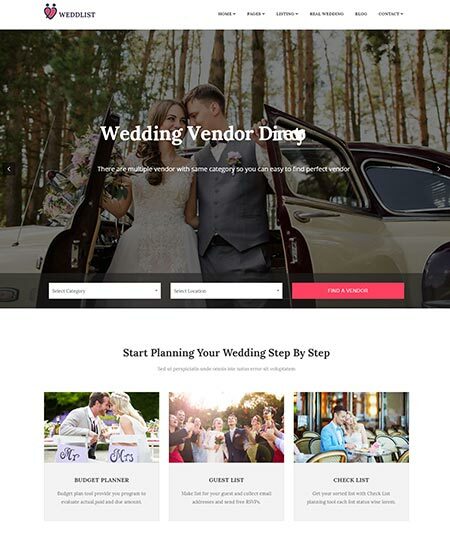 It is a standard and fashionable WordPress theme for Wedding Couple and planners. It has all the necessary features to make your big day as you wish to be. Some wedding facts need to give more important that we often can’t give. WP Forever can look for them instead of you. It has options for a countdown, gifts, registry, bridesmaid, groomsmen, budget lists and so on. The packed it with lots of standard structure. It is built with the powerful visual composer page builders along with valid HTML and CSS3 codes. Besides, it has one click demo and fast installation. WP Forever is very easy to use and install. It would be a great idea to make a bright memory. The photo gallery and event’s story will keep those facts in a nostalgic way. So this great theme should have a recommendation. 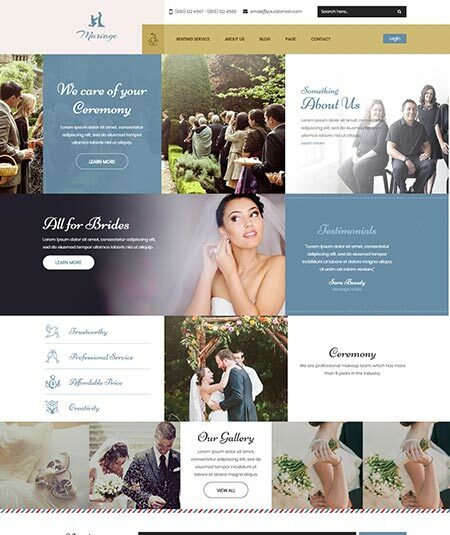 Bibaho comes with an uncommon and beautiful theme for those who are interested in making websites about wedding, The simplicity of Bibaho makes it usable both for desktop and mobile. KingComposer, One click Demo importer, Codestar Option etc modern tools are used in this theme. Also 2 types of menu are available in this theme to make this theme smoother for the user. gallery, contact from 7, love story, events details, google fonts, google maps and may others which help one to customize as their wishes. 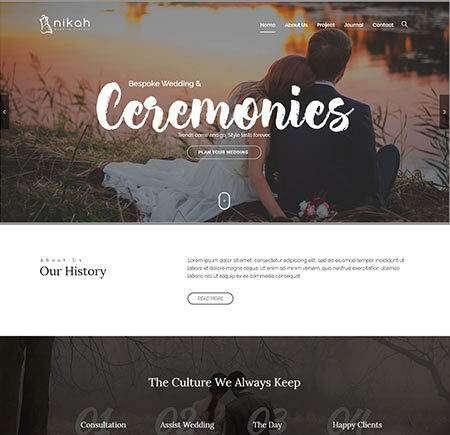 NIkah is a great theme for a wedding based website for all kind of users. There are a lot of the options that make the users get easy with their sites. There are infinite colour skins and 3 different single portfolios there are a lot of fonts and customized options so one can write special wisher with unique fonts to fulfill their wishes. There are unlimited design options. So it’s really easy to decorate the site even for a beginner user and 35+ widgets for the users to customize the site more smoothly. Also some good features like one click demo import, live customizer, extra optimization etc are available. 600+ google fonts also accessible. 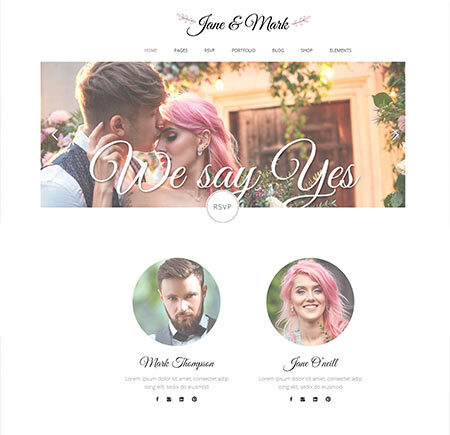 For making a gorgeous sites Jane & Mark is the perfect theme for the couples. This theme comes out with a lot of features and makes the site more smooth and stylish. There is a large collection of useful inner pages. Side area, latest post widgets and social icon widgets are available. It is highly customizable so user can feel comfortable with theme. One of the most advantageous fact is the user needs no coding knowledge to update the site or to add content to the site. Besides many plugins are available in the theme. Mega menu, parallax sections, big shortcode collection, smooth page transition, customize google map etc. and others important features are also available. Kristen is an excellent theme for a wedding photographer to attract clients in a good number. Its smoothness helps to create an amazing portfolio. Not only professional photographers but also beginner photographers can take control over the theme and can make their sites more attractive. The theme is so simple to use, update something or attach something of expectation. Besides it has a great reputation in the list of wedding themes. Users can decorate their sites also can display their best photography in different styles that attracts the customers more. Even it looks good both on mobile and desktop version. There is an easy color management system that is also helpful for the user. Kabheen comes with the latest wodpress technology theme for wedding. Those who will get married can have one of the best theme with a great support by using Kabheen. The beginner users can also use this wedding theme easily because of its key features and other advantages. It can be used both in desktop and mobile devices. It has a filterable gallery and very easy to create. User can import demo data and it’s the easiest way to setup the theme. One click installation system helps the user to setup smoothly. Regular updates and adding content is also easy to get. 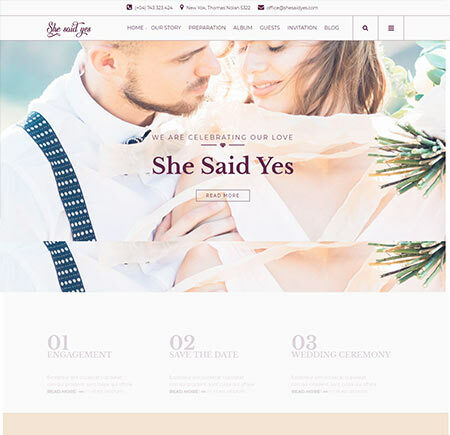 SheSaidYes comes with one of the fastest and gorgeous wedding theme for the couples who are ready for engagement or wedding. The most unique colors and shortcodes are also found in this theme. The best plugins are are given by the theme even the premium plugins are included, so users don’t need to cost extra money over plugins. Besides it is one of the fastest theme and very easy to use. People looking for wedding party or happiness celebration can have the best theme Lovus which is designed especially for this programs. It’s a lovely and smooth theme for the users. 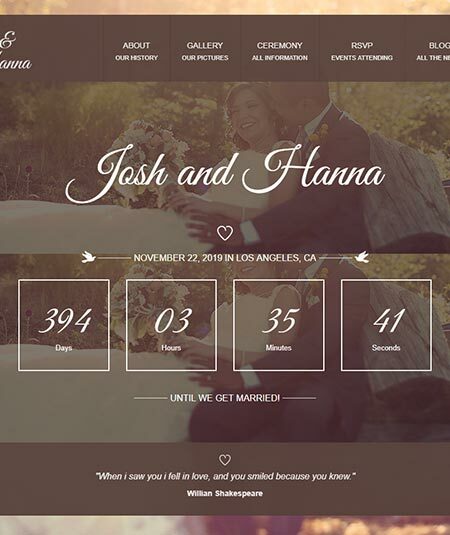 This wordpress wedding website let the user design their sites easily like their wishes. It has the latest web technology that ensures to keep the site well organized. One click import demo content is also available. Lots of features are available and also ready translation advantages are here in this wedding reception theme. Stylish google map system to make the site more useful. Smooth transitions and unique animations make the site more attractive to the costumes. 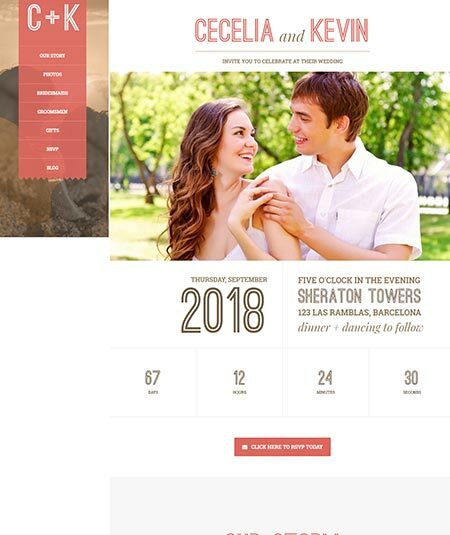 Dexter is the perfect wordpress wedding theme for those who are preparing events and organizing ceremonies. This is both usable in desktop and mobile devices. Dexter has a great speed to use. 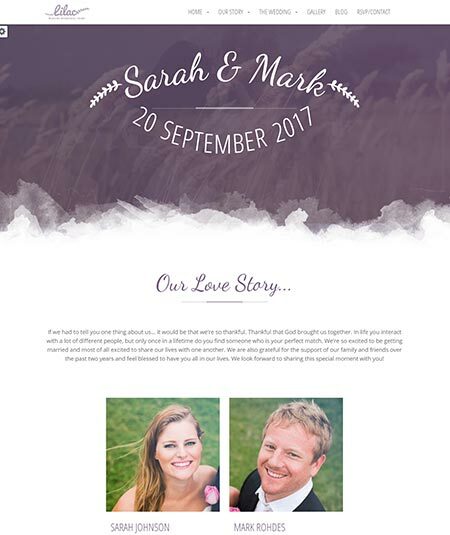 A lots of colors and lots of unique fonts help to set up a good website about wedding. One can join to their socal networks facebook, twitters and other social sites. Wedding projects can be published and photo sharing publicly is available. They are giving many advantages such as 4 new homepages, 4 new gallery styles, 2 new portfolio styles and many others that let to show the owner’s page more attractive to the customers. OneLove is a beautiful and amazing wedding reception theme multiple ideas for the couples who are planning for wedding. This theme is very easy to customize and it’s is fit with both desktop and mobile device. There are about 21 home page designs for the user. The guest are allowed to be connected with the users of OneLove theme. Besides this theme gives a reliable support to the users. More than 9 inner pages available here and that can be quickly adapted to the user’s necessary. Many useful plugins are attached to the theme that helps to customize the site more easily. Lots of features advantage let the user to make an unique and gorgeous website. There are 500+ google fonts and mega menu system. 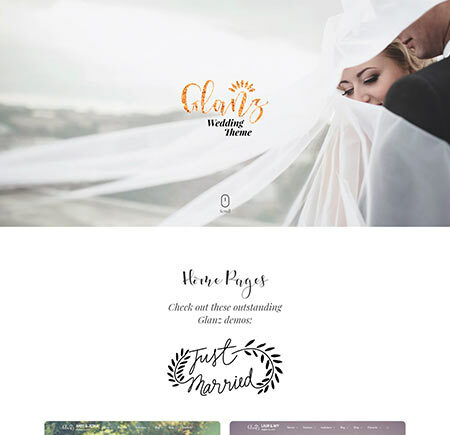 Glanz is a profitable theme for creating a beautiful wordpress wedding website about wedding ceremony celebration. This theme is suitable for both in mobile version and in desktop and very easy to customize. .They are giving a 30 days free using advantage. If the users feel uncomfortable with this theme Glanz pays back 100% money. That makes the theme a reliable one to buy. There are a lot of colors and stylish fonts. Amore is a great theme for wedding invitation or engagement and it is very easy to handle. User can choose this theme in the list of wedding theme. Amore gives a very good support. Plugins are too good and lots of features are available in this theme and thats makes this theme a great one. Wedding is an excellent and beautiful wedding theme for the groom and bride. For a perfect website for wedding Wedding gives a very easy setup and customization system for the users. It is clearly ahead in the list of wedding theme. There are 11 pre-made unique a gorgeous homepages. They are specifically for groom and bride. Users can post the wedding day lay out, time, date, venue and others important matters with a stylish view. 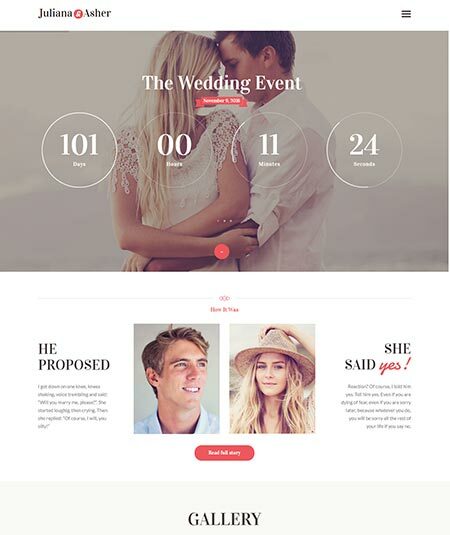 Wedding has their theme core features such as powerful page builder, oneclick installation and others. Unlimted colour option and 6+ layout options for gallery page advantages let the user feel comfortable with the theme. The most popular plugins are available. Besides some paid plugins save extra costs of user. This theme has the best features for woocommerce. So overall certainly Wedding is a very profitable and a perfect theme to use. For advertising, showcasing business and for an upcoming wedding, the most responsive and an attractive theme is Elegant Wedding. The themes let the user to put all the information about wedding on the website nice and decoratively. There is a one click demo content installation system advantage. The have the count-down display option for the big event. The have a beautiful photo album there the user can upload and display the best photos. The guests must easy understand all the information about the wedding. The customization system is very easy, so even the beginner user can use this theme smoothly and no coding knowledge is required. They have a very friendly supporting team who are always appointed to solve the problems of the user. Lots of features are available for the user that they can feel comfortable. So one choose Elegant Wedding for their upcoming wedding ceremony.